With just one contested race on the ballot, voter participation was at a record low for the Tewksbury Municipal Election, Saturday. According to information provided by Tewksbury Town Clerk Denise Graffeo, just just 943 of Tewksbury's 20,073 registered voters cast ballots, for a participation rate of just 4.7 percent. Based on available information and statistics, it is the lowest voter turnout in town history. The lone contested race saw Keith Anderson defeat George Ferdinand, 688-224, seat on the Planning Board. Anderson will succeed Dave Plunkett, who opted not to seek re-election. "I was disappointed in the turnout but I'm grateful for the support I received to get elected," said Anderson, owner of Anderson Flooring and a first-time candidate for elected office. "As I've said all along, my goal is to move Tewksbury forward." Anderson said he is looking forward to his first meeting on the board and plans to learning from veteran members as he gets his feet wet.
" I want to make objective decisions in the best interests of the town," he said. "I'm going to do what's in the best interests of Tewksbury." Ferdinand, who moved to Tewksbury less than a year ago, was also surprised by the low turnout. "I really thought it would be more like 1,500 or 2,000," he said. "I'm disappointed. But (Anderson) ran a clean campaign. I'll stop by his store this week and congratulate him." Ferdinand said he plans to be active in town and will be looking for opportunities to volunteer his time to serve on appointed boards and committees." Another new elected official is Mark Kratman. He and incumbent David Gay were unopposed in their race for two available seats on the Board of Selectmen. Kratman replaces Scott Wilson, who chose not to seek re-election. Gay received 703 votes, Kratman received 669. 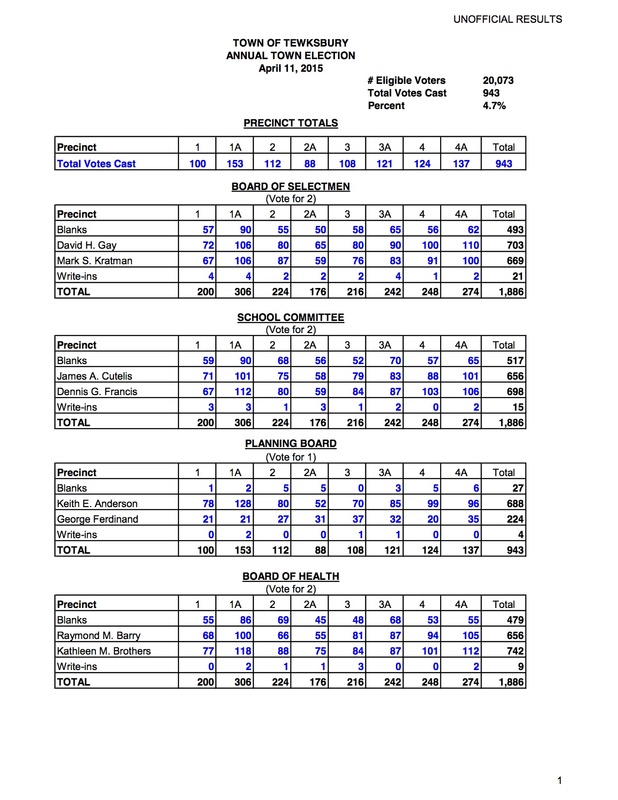 Lisa Puccia received 694 votes, running unopposed to win a seat on the Shawsheen Tech School Committee. Puccia, who also serves on the Tewksbury School Committee, replaces Mike Kelley, who did not seek re-election. Lorraine Carriere was unopposed in winning a two-year term on the Library Board of Trustees. The two years is the unexpired term of Robert Homeyer, who resigned when he moved to Florida. 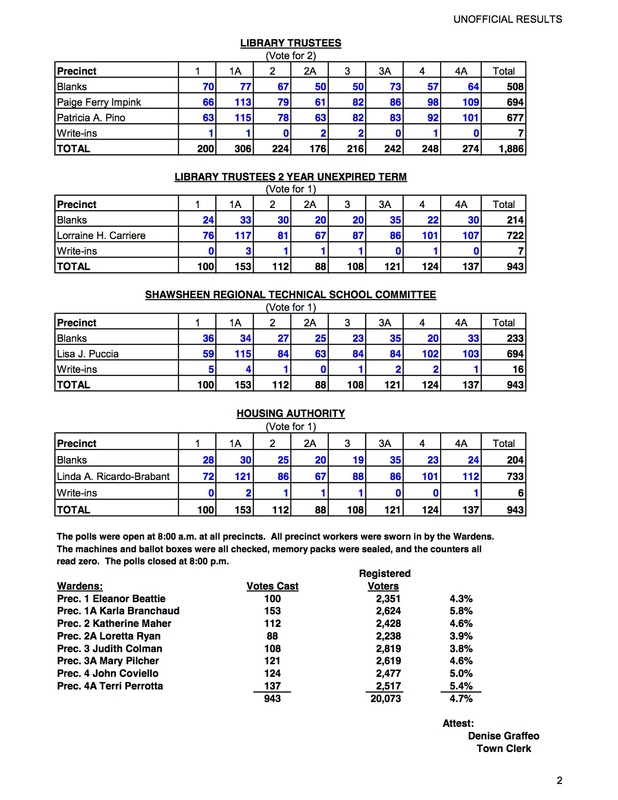 Here are the complete unofficial Tewksbury Election results.